This arrived today and rather lovely it is too. Managing to sound like a mixture of John Zorn – in his most hedonistic moments – and the best doom merchants out there but also crossing over into a more ambient sound-scape in parts – this (as the blurb says below) manages to transcend various genres and yet still retain it’s own identity. The varying musical backgrounds of the contributors make for a refreshing distillation of a cross section of tones, palettes and visceral noises. Shifting from airy spectral sounds in one instance to intense metal noise in the next – and in some instances combining them to create a heady brew – this is well worth a listen. “Metallic Taste Of Blood is an instrumental album brought about by the collective work of Eraldo Bernocchi (Winter Garden w. Budd and Guthrie, Obake with Pupilllo, Pandi and Fornasari) on guitars, pianist Jamie Saft (of New Zion Trio, Zorn’s electric Masada, Cuong Vu, Marc Ribot and others), bass-player Colin Edwin (of Porcupine Tree and Ex-Wise Heads) and drummer Balazs Pandi (of Venetian Snares, Bong Ra, Obake, Merzbow and Otto Von Schirach). Manifestly undefinable, Metallic Taste Of Blood collects very diverse strands and genres of music (from metal, dub, avant-jazz and progressive rock primarily) and fuses them into instrumental compositions that tightly straddle what on paper appear total opposites (thus truly representing RareNoiseRecords’ ethos). Both brutal and delicate, distorted but clear, boiling and cool, sweet and brackish, as per the band’s own name. Yet perfect balance is reached, when distorted guitars sound clean and soothing, while cascades of piano notes suddenly morph into threatening shards – listening to this will lift you into a state not unlike that of cognitive dissonance, one of deep, uncomfortable enjoyment. Jamie Saft is a virtuoso pianist, keyboardist, producer, and composer from New York. Saft’s stylistic versatility, multi-instrumentalist capabilities, and production skills have been featured with Beastie Boys, Bad Brains, The B-52’s, John Zorn, John Adams, Laurie Anderson, Donovan, Antony and the Johnsons, and scores of other artists. Saft leads the New Zion Trio and is a core member of bands such as Grizzly Adamz, Electric Masada, The Dreamers, Kingston Yard, Whoopie Pie, OV, and Kalashnikov. Saft has composed a number of original film scores including the Oscar nominated “Murderball” and Sundance winner “God Grew Tired Of Us.” Saft has also scored extensively for Nickelodeon, MTV, VH1, Vice TV, NFL Football, CBS, and A&E. Saft currently runs the independent record label Veal Records as well as Potterville International Sound, both based out of Kingston, NY. Colin Edwin (born 2 July 1970) is an Australian progressive rock musician. Since December 1993 he is a member of the British band Porcupine Tree, where he plays both fretted and fretless bass guitar as well as double bass and guimbri. Edwin is also a member of Ex-Wise Heads, a three-piece group that mixes ethnic, ambient, and post- modern influences, as well as a metal-influenced project, Random Noise Generator. In 2009, Edwin released his debut solo album titled Third Vessel, available through Burning Shed. Eraldo Bernocchi is an Italian composer, arranger, producer and guitarist. His music career started around 1977, as a guitarist in independent punk bands. In 1985 he founded the conceptual audio project and eventual international cult act Sigillum-S with Paolo Bandera and Luca di Giorgio. In 1985, together with his wife Petulia Mattioli, he founded the cultural project Verba Corrige Productions, which became a home for a raft of notable audio visual projects and collaborations: over the succeeding decades and until now, Eraldo Bernocchi has collaborated with Mick Harris (SIMM, Black Engine), James Plotkin, Bill Laswell (Somma, Charged, Ashes and numerous others), Nils Petter Molvaer, Harold Budd (Fragments from the Inside), Russell Mills, Toshinori Kondo (Charged), Raiz, Almamegretta, Thomas Fehlmann, Zu (as Black Engine), DJ Olive, Markus Stockhausen (Costituto – with Lorenzo Esposito Fornasari), Giovanni Lindo Ferretti (as producer) and numerous others. During the 90’s Eraldo composed film music for Oscar winner Gabriele Salvatores’ Denti and produced numerous art installations with Petulia Mattioli and Russell Mills. In 2008 he was co-founder in UK record label RareNoiseRecords. The label has since released a number of his recordings, including ambient guitar duo Parched (with Davide Tiso), Somma (with Nils Petter Molvaer, Bill Laswell, Raiz and Lorenzo Esposito Fornasari). The first release of OWLS, The Night Stays, has also been released by RareNoiseRecords Q1 2011. 2011 saw the release of Obake, a doom-tronic quartet with Massimo Pupillo of Zu, Lorenzo Esposito Fornasari and Balazs Pandi. Hungarian drummer Balazs Pandi has been in the music business for 18 years. That might not be saying something, but considering he is only 26 years old, that really is a fact to be boasting about. He started playing the drums at the tender age of 9 playing in a youth orchestra and have since been in countless formations in his native Hungary. His restless and adventurous spirit has lured him into a never-ending stylistic journey. From punk/HC, grindcore, stoner metal, he has rock- drummed them all ( he even got asked by bands, like UK grindcore pioneers Extreme Noise Terror, and LA based punk/metal band Amen to join them as a full time member ). But he has also ventured well beyond the limits of the guitars-bass-drums band setting: in the last couple of years he’s been – successfully – testing the waters of improv jazz and contemporary music, and even more significantly, he’s been getting very much into today’s experimental electronic music, recording for the most respected producers these days. His most recognised and famed – ongoing – collaboration is with breakcore’s genius figurehead Aaron Funk aka Venetian Snares with whom Balazs has been making music since 2006. Their musical relationship extends from recording and writing tracks together to VS sampling the already recorded drumming of Balazs on his recent tunes. Balazs’s musical other half is Otto von Schirach (who made a name for himself as Skinny Puppy’s producer): the two have been playing live shows together since 2006. On their last British tour they were invited by none other than Aphex Twin and played for 5,000 people in Manchester. Also in 2008 they headlined the biggest tent Dour Festival in Belgium playing to a massive crowd of 10,000. Their first studio collaboration is scheduled late 2010. (A video report available online covering their now infamous show at Sziget Festival in Budapest, Hungary – the biggest summer music festival in Europe – has generated more than 80,000 views making it the online tv channel’s most popular clip. 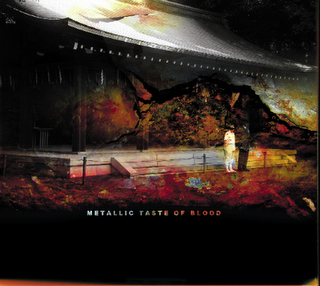 Posted on April 30, 2012 by HalfEdgeMediaPosted in Album ReviewTagged Metallic Taste of Blood.